On Sunday our church’s boiler malfunctioned and so we worshipped in frigid temperatures. I am not nearly so affected by the discomfort of the cold since I am well outfitted by my vestments. But as I greeted people at the end of the service, it was a shock to the system to shake so many chilly hands. The forecasters were calling for snow on Monday. It’s April. What else is new? If you live in Northern Ohio, you come to expect the weirdest weather. A popular slogan around here is that if you don’t like the weather, wait five minutes, it will change. Opening days of baseball season have been snowed out. 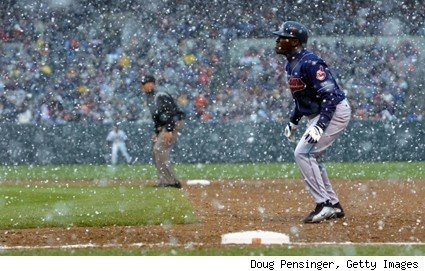 I recall one year in the late 1990’s, when I was working for the Cleveland Indians, walking around the ball park with an astonished wide-eyed minor league pitching prospect from Venezuela who had never before seen snow. The Indians were playing an exhibition game in the less than two year old Jacobs Field amidst persistent flurries that approached near whiteout conditions. He asked me if what he was seeing was typical. I had to resist the urge to terrify him with a resounding, “Yes!” So I simply explained to him that it does happen sometime. I remember seeing him the next year in Spring Training at Winter Haven, bathed in a pool of sweat in the humid Florida heat, and reminding him of what he had to look forward to in a few weeks. Sadly, he never made it to the Major Leagues. As I grow older I understand why people move to warmer climates later in life. I was born in Puerto Rico, but have spent the bulk of my life in Pennsylvania and Ohio. Though I’ve grown to love the change in seasons, I yearn for milder winters that don’t linger into early May. Where is global warming when you really need it? With one exception, Scripture always portrays snow in a positive light. In most cases, is symbolizes purity, the outcome of the forgiveness of sins. Leprosy is the lone negative. So where am I going with this seemingly aimless rambling? I really don’t know. I simply felt like taking a page out of Mark Twain and talk about the weather. After all, we can do nothing about it. If I’ve stolen valuable time out of your day to read this post, I apologize. But do me one favor – read Isaiah 55, especially verses 10 and 11, part of which appears below. May God’s word provide you with comforting thoughts for an otherwise gloomy weather day.